Answers: According to income tax Act 2058 Natural resource payment means amounts of any of the following payments. a. Amount received for the right to take water, minerals or other living or non-living resource from the land. b. Amount as calculated in whole or part by reference to the quality or value of water, mineral or a living or non living resources taken from the land. 1. Confinement of all tax related matter: All legal provision of income tax is confined in this act is considerate as code for the income tax matter. 2. Provision for set-off and carry forward of losses: Business losses are adjusted next year of income in this act. 3. Residential status: This act is clearly distinguished residential status and non residential status. Non residential status also taped on their income with source in Nepal. 4. Medical tax credit: For resident natural person medical credit as well as specific deduction facilities has been provided by the act. 5. Focus of self tax assessment: This act has followed self tax assessment system as tax payer friendly environment. Question No. 3: Write short notes with suitable example where necessary. (a) Medical Tax Credit (b) Assessment Year. a. Medical Tax Credit: For residential ,natural medical tax credit deduction facilities are provided by act. Tax payer can deduct 15% of medical expenses or Rs. 750 whichever is less can received medical tax credit. b. Assessment Year: Tax countable year is known as assessment year. After finishing income year assessment year is start. Suppose, if income year is 2070/71, 2071/72 is assumed as assessment year. Question NO. 4: Write in brief of any five features of Nepal Income Act. 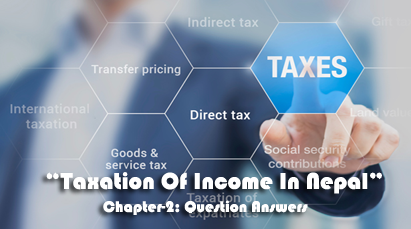 Answer: Income Tax Act is permanent in nature. It is started in 2031. After 28 years later it is revised as Income Tax Act 2058 and is acted in Nepal. But Financial Act is temporarily in nature, normally one year but both are presented and approved through parliament so they are interrelated with each other. All income generating activities are into Tax. a. All groups of people are liable to pay equal amount of tax at equal level of income. b. Minimize tax avoidance and tax evasion. c. Make income tax elastic and revenue productive. d. Make Tax Administration is more effective and responsibility. Answer: Excludes following assets land building an interest in an entity or securities are Non Business Assets. a. Business assets, depreciable assets or trading stock. b. A private building of an individual that has been owned continuously at least ten years and different time to time total period of ten year or more than ten years. c. Land, house and land or private building of an individual is disposed in less than thirty lakh rupees. Private building refers to "building and land occupied" or "one ropany land" which ever is lower. d. Assets disposed off by way of any type of transfer other than sales and purchase made within three generation. a. Previous Year: According to Income Tax Act fiscal year is known as previous year which is started in 1st Shrawan and end at 31st Aashad. b. Tax Deduction At Source: When payment parties paid to the concern parties after deduction predetermined tax rate is known as Tax Deduction At Source. Residential entity received dividend after deduction 5% tax is the example of TDS. 0 Response to "Taxation Of Income In Nepal [Model Questions and Answers] | Unit-2 | TAXATION | BBS 3rd Years | NOTES"